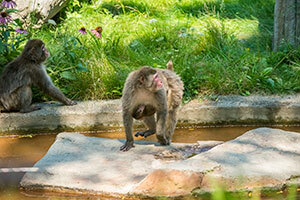 The Milwaukee County Zoo is pleased to add six Japanese macaque monkeys to its existing collection. The new residents arrived last summer from around the country, including females Zeppeki and Usagi from Green Bay, females Negai and Rikka from Minnesota, male Kota from New York and Kaishi, the male baby of Negai. Their ages range from 8 months to 5 years old, which is considered relatively young for Japanese macaques. According to Trish Khan, Primate and Small Mammal Curator at the Zoo, their young age is vital to their integration process. The macaques come to the Zoo as part of a Species Survival Plan® (SSP), which manages endangered or threatened species within organizations accredited by the Association of Zoos & Aquariums. The Zoo and SSP would like to see breeding take place in the group once Kota reaches maturity in two to three years. Visit Macaque Island, located between the Stearns Family Apes of Africa and Primate buildings and the Oceans of Fun Seal & Sea Lion Show, to the meet the Zoo’s new Japanese macaques!